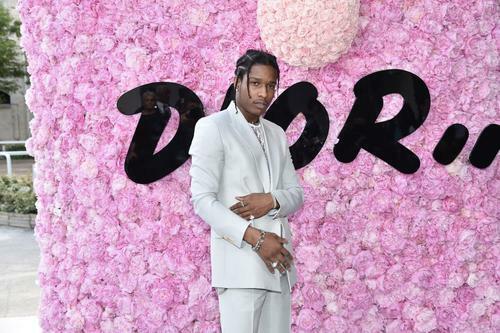 A$AP Rocky's first Under Armour sneaker collab still has not been fully revealed, but it looks like the kicks are slated to release in September. Rocky made an appearance The Daily Show with Trevor Noah last night where he gifted Noah with the kicks and revealed that they'll be hitting retailers next month. Noah didn't unbox the shoes on air but we did get a look at the packaging, which consists of two bright yellow boxes, one for each shoe, with the size printed in large font on the outside of each box. Although Under Armour is keeping the shoe under wraps for now, leaked images have provided a decent idea of what to expect when the kicks release this Fall. British director Dexter Navy and several others have shared samples of Rocky’s first sneaker collaboration with Under Armour, showcasing a bulky, low-top silhouette reminiscent of some old skate shoes such as the Osiris D3. The kicks look to feature a padded mesh upper accompanied by leather overlays and midfoot cages. The bulbous tongue references that the shoe was created in association with A$AP Rocky, and is part of Under Armour’s “Sports Style” division. While we await more details, check out Rocky's appearance on The Daily Show with Trevor Noah in the video embedded below. Nicki Minaj & Madonna Have A "Secret Coming Soon"